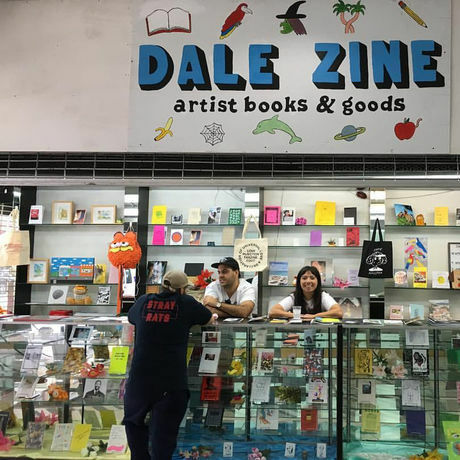 Dale Zine, established 2009 in Miami, is an independent publisher with the goal of giving a platform to multimedia artists and designers. With humble beginnings as a zine collaboration about Garfield, Dale has broadened into something of an open cultural space for the Miami community, with offerings ranging from all-age zine workshops to our independent radio show, pop-up events, and most recently a storefront in Downtown Miami. Collaborations of note include those with Tim Biskup, Matt Furie, Legowelt, Friendswithyou, to name just a few of our over 50 titles and counting. You can find our work in Miami, Tokyo, LA, New York, Beijing and online at DaleZine.com. In addition to publishing our own original content, we also host a series family-oriented art workshops that focus on the creative empowerment of the children (Dale Kids). Plugging in with some of the city’s premier international philanthropic organizations (Lincoln Road, the Knight Foundation, Bas Fisher Invitational, the Andy Warhol Foundation, and the Soho House, among many others) has been completely vital to our outreach efforts. Thank you guys! Visit us at our flagship location in the 777 mall in downtown Miami. Truly unique in the South Florida, the Dale Zine shop is all about getting to know our city’s independent voices in a fun friendly environment through the most low key format ever, the zine. Check in with us at DaleZine.com to for info on upcoming events and workshops with Mana Contemporary. We really dig meeting new people! See you soon!